Let me apologize for the quality of the photos of the Warrior Portrait Mask by Jerry Smith. A friend of mine had recently acquired a digital camera which I hoped to use, but he had indicated that he wasn't happy with the camera and when I contacted him about taking these photos he had returned it. Consequently I purchased an inexpensive camera at the drug store along with some film, and these are the first photos taken with this camera. I felt that only indoor photos of this mask would not do it justice so I took advantage of the afternoon sun last week and shot several photos of the mask out on the boulevard. I was always impressed with the intensity of the gaze of this mask and wanted to capture it for the viewer. This was one of the first photos I took and it came out better than I had expected. The hanging object in the lower left-hand corner is a Chinese calendar. 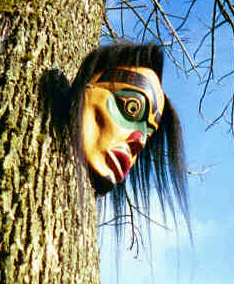 Another outdoor shot of the mask from a different angle. 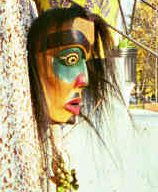 A side view shot taken outdoors. I can be reached at the e-mail address given below. 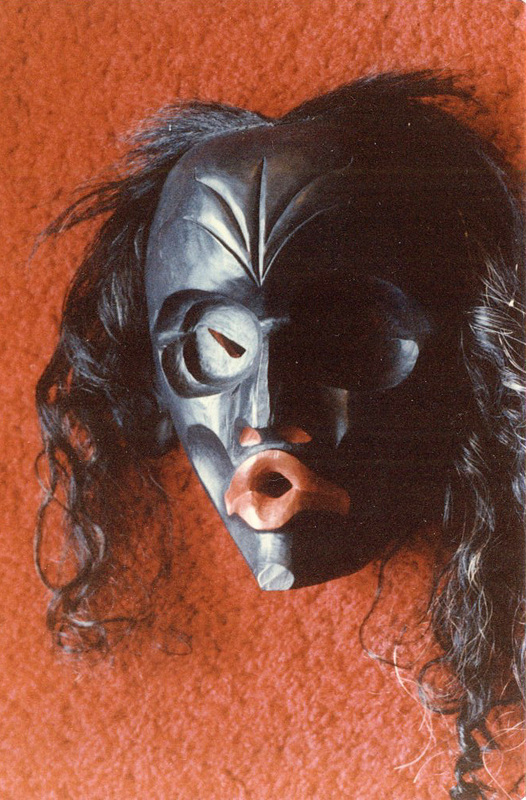 A mutual friend of Jerry Smith's and myself kindly lent me photos of two T'sonoqa masks carved by Jerry for display on this website. I had them scanned to disk at the local copy centre, and when I viewed them on my computer found they were far too large to place on a page with accompanying text. Consequently I will have to give a brief comment on this page and then you will have to click through to each mask. 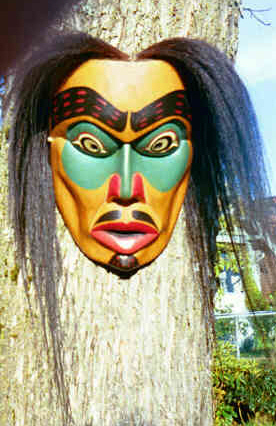 The first mask is to me a powerfully expressive mask which tells the story of T'sonoqa, the Wild Woman of the Woods. 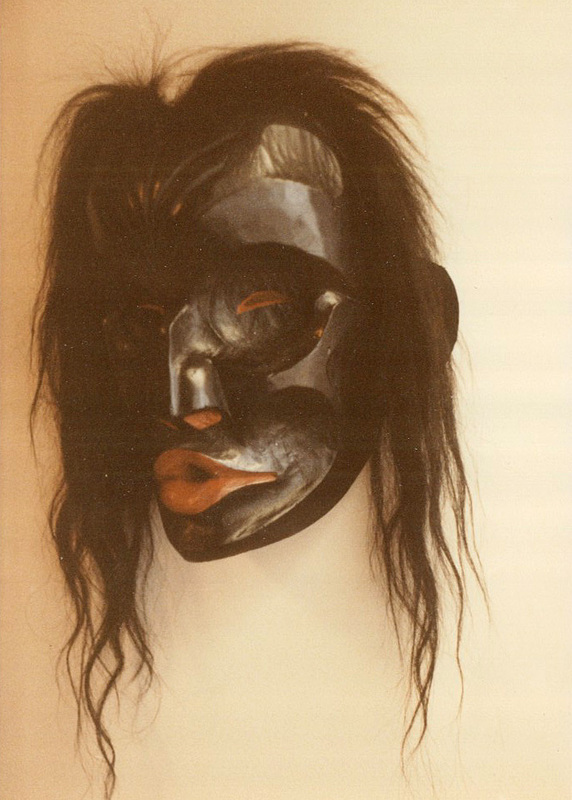 Like all the T'sonoqa masks I've seen carved by Jerry Smith, it is done in a traditional style of pursed lips and red-rimmed, half-closed eyes. 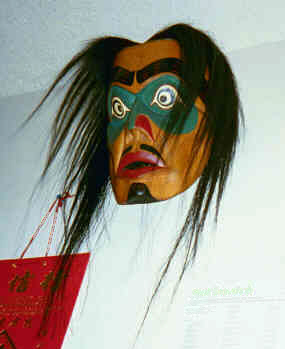 The second mask is another dynamic example of a powerfully expressed traditional rendering of T'sonoqa. At one point this mask belonged to a friend of mine who collected T'sonoqa masks and this was easily the best and most eye-catching of his collection.